Today we are excited to introduce our first official update to the company rankings in Mattermark. The “Mattermark Score” has been split into two new indicators, each with more descriptive names: the Growth Score and the Mindshare Score. Our job is to help dealmakers find the most promising prospects, and these scores are algorithms we’ve created to filter out the signal from the noise. We weigh billions of data points to return a useful ranked list organizing the 800,000+ companies in Mattermark. The Growth Score is now the default ranking for all companies in Mattermark. It works by counting a company’s website visitors, mobile downloads, social media metrics, employees, and publicly announced funding, all tracking how these numbers change over time. The underlying assumption is that companies who see growth across these signals are shipping product and talking to customers, and are more likely to continue to grow as a result. The Mindshare Score is the original Mattermark Score with a new name. It combines web, mobile and social traction to summarize a company’s growth of online attention. Think of it as a subset of the Growth Score that accounts for social signals and the company’s ability to gain and retain attention online. As you can see, these new rankings move several unicorn startups to their rightful spots in top positions, and reveals many of the fastest growing and most valuable private companies. Applying additional filtering such as stage and geography helps bubble up opportunities that fit with specific prospecting criteria. How Are These Scores Calculated? Our original rankings began with the Mattermark Score, which is an algorithm created by Danielle Morrill, Kevin Morrill and Andy Sparks — the founders of Mattermark. The Mattermark Score is still in use today, but as we continue to collect more data and learn more about the problems we are solving it has become part of a larger set of algorithms that power scoring and ranking of companies. These algorithms are extremely valuable to our business, and will remain “black box.” The exact formulas for calculating these scores, which will continue to evolve over time, are not going to be revealed. Users can observe the inputs (the same raw data you can view in Mattermark) and benefit from the output (the company rankings) but what happens in the middle is the secret sauce we’re developing. Instead of agonizing about how we’ve built our scoring system, we encourage customers to use our data to build their own models and deepen their analysis to get an edge beyond what we provide. 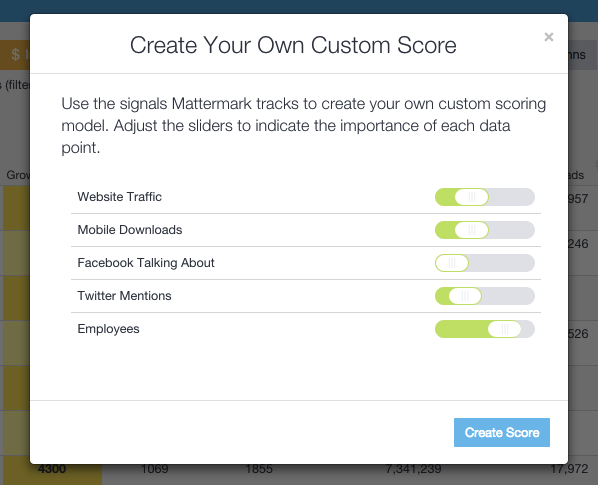 Mattermark customers also can also build their own scoring algorithms by applying custom weights to the dataset through our web-based interface. Any Mattermark customer can run ad-hoc models against our entire set of companies, returning the results of their Custom Score in seconds. To give you some sense of how powerful this can be, just try doing the same thing with a 800,000 row spreadsheet in Excel. A model is only as good as the data put into it, and that’s why we’re on a mission to deliver the most comprehensive historical dataset of business growth signals. The universe of companies we currently cover includes more than 800,000 startups, technology enabled service businesses, and other businesses with rapidly growing online presences. Beyond broadening company coverage, we are doing groundbreaking work in cleaning and organizing business information using machine learning (and we’re hiring!). Mattermark is your outsourced data science team, building the data collection, machine learning, and analysis processes to give you deal prospecting superpowers at a fraction of the cost. Our customers’ expectations for the kinds of questions they should be able to answer, and data we should make available, will continue to climb as we open up new lines of questioning. It is not known exactly how many businesses there are globally, but estimates range from 250 to 300 Million and growing. Our goal is to track all of them with Mattermark, and if this first 18 months is anything to go by we definitely have our work cut out for us. Our data set is already growing a millions of rows per hour, and this is just the beginning. I look forward to sharing many more improvements to our rankings and other tools as we go. If you haven’t yet, please sign up for a free trial and check us out.